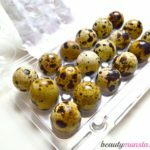 Top 10 Foods Good for Acne Prone Skin - beautymunsta - free natural beauty hacks and more! About 80 percent of people worldwide suffer from acne at some point in their lives. 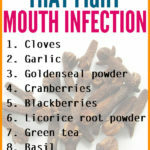 The majority may do almost nothing about it while other people will either go for over the counter acne treatment or seek out home remedies. Home remedies work wonders in healing acne naturally. You will feel comfortable and glad to know that you’re using natural ingredients on your skin: whether it’s the yogurt you’re slathering or the brown sugar you’re scrubbing your face with, all these are perfectly safe for skin, unless you have allergies. One of these home remedies for acne is eating foods good for acne prone skin. 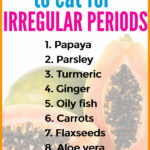 Eating the right foods CAN help get rid of acne and keep further acne away by normalizing the body’s natural pH levels. Ensuring you’re nourishing your body from the inside and staying away from acne flaring foods will definitely keep the acne away. Salmon contains high amounts of omega 3 fatty acids, a protein that is vital for healthy skin. Omega 3 fatty acids are healthy fats that promote healthy glowing skin. They stimulate collagen production and pr0mote cell growth and regeneration. When it comes to preventing and treating acne, omega 3 fatty acids help fight inflammatory acne. Studies show that omega 3 fatty acids limit the production of leukotriene B4, a pro-inflammatory compound that increases sebum production as well as inflamed acne. Eat salmons regularly to heal existing acne and keep more acne away. Carrots not only keep your eyes healthy but also fight and prevent acne! Carrots are rich in a variety of carotenoids including beta carotene, zeaxanthin and lycopene. These powerful antioxidants help create a protective shield over skin cells, thereby protecting the skin from UV rays. 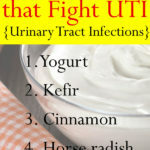 They also help flush out toxins from the body especially the liver. These toxins normally stay in the body for long periods of time before finally sprouting out as pimples and acne. Carrots are alkaline foods that assist in clearing acidity in the body by eliminating toxins and excess salts that cause acne. Studies show that cooking and juicing carrots will facilitate more efficient absorption of the antioxidants into your system. So enjoy your carrots juiced, steamed or cooked in a veggie stir-fry more than munching them raw! Rich in vitamin C, red and green bell peppers are a great anti-acne food too. Most acne and pimples usually come with inflammation. And getting rid of that inflammation and redness will definitely make your acne appear milder than before. Eating vitamin C rich foods such as bell peppers will absolutely soothe down red inflamed acne. Bell peppers are so rich in vitamin C that adding 1 medium bell pepper to your diet will give you more than 100% of the daily required amount of vitamin C. This means bell peppers contain more vitamin C than oranges! Incorporate bell peppers into your daily diet by adding them to soups and omelets for an acne free face! This delicious tropical fruit is bursting with powerful antioxidants and phytochemicals for healthy skin. Enzymes in pineapple fight against free radicals that block pores together with grime and cause acne. Pineapples are also very rich in fiber. Fiber helps regulate bowel movements and expel toxins out of our bodies. These toxins, if not removed for a long time, especially when you are constipated, can reabsorb into the bloodstream and come out as acne. Another amazing benefit of pineapple for acne is that it contains a vital enzyme called bromelain that softens rough acneic skin and also fights inflamed and swollen acne. Chop up a ripe pineapple, blend it with some ice cubes and enjoy a refreshing anti-acne tropical fruit drink! Related: 15 Beauty Benefits of Pineapple for Skin, Hair and More! Get a significant amount of vitamin A from butternut squash. You can get a whooping 297% daily value of vitamin A by eating 1 cup of this beta carotene-rich food. In butternut squash, the vitamin A in acne is the acne miracle at work here. Vitamin A is a powerful antioxidant that will boost your immune system, staving of acne causing bacteria and germs. Most acne is caused by hormonal fluctuations that tend to send a signal to your skin which starts secreting sebum in overdrive. And we all know that excess sebum is one of the biggest contributors to acne. Eating butternut squash regularly will provide you with a high dose of vitamin A, which will keep your hormone levels in check. Snack on a handful of pumpkin seeds every day with your cup of tea. This way, you’ll not only help trim off excess weight gain but also heal acne and other bacterial skin conditions. Pumpkin seeds have high concentrations of zinc, which is the main mineral you will find in most acne treatment products. Our skin has a significant 5% amount of zinc which means zinc deficiencies can negatively affect our skin! Zinc is essential for cell growth, development and replication. as well as carrying vitamin A to your skin. Zinc also helps in healing of acne wounds and regulating the body’s hormone imbalance. Pumpkin seeds are also rich in beta sistosterol, which helps strengthen the skin tissues and cells and heal acne. Have your pumpkin seeds only lightly salted for good results. 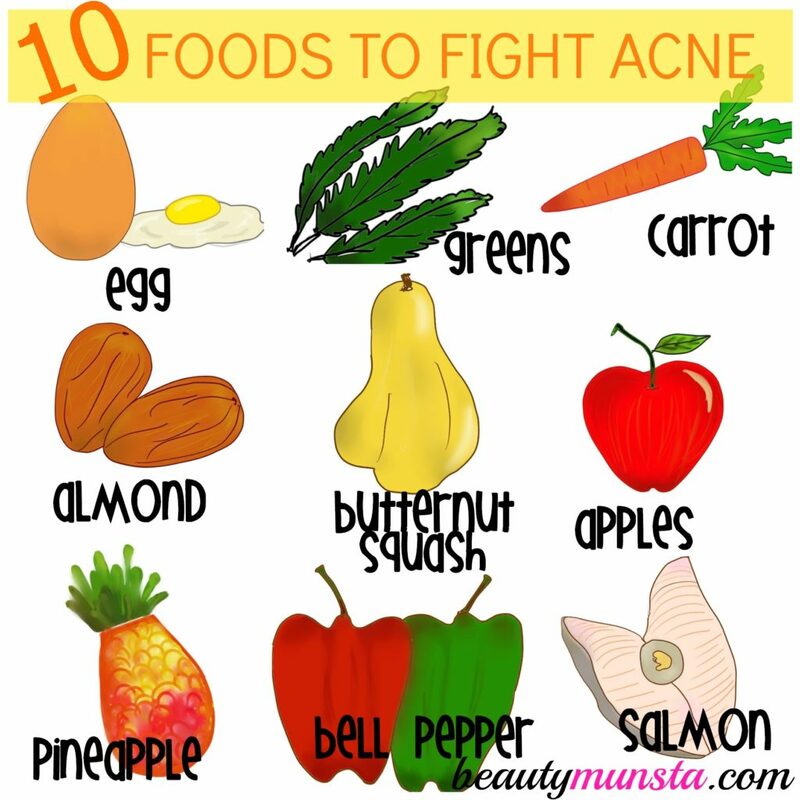 So, while it is widely said that food has little or no effect when it comes to causing acne, it does have a lot of effect when you eat healthy foods for the purpose of helping prevent and treat acne. And anyway, it doesn’t hurt to toss some almonds into your veggie salad next time. Your skin will love you! 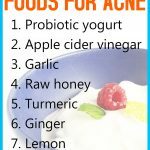 These foods good for acne prone skin are rich in powerful nutrients that will nourish your skin and fight free radicals and acne causing bacteria. As usual, make sure you’re not allergic to any of the foods good for acne prone skin above before incorporating them in your daily diet. Please ensure to always buy organic and fresh produce and avoid processed/factory made/GMO foods. If its eggs, try your best to buy free range.